The Environmental Protection Agency has established air quality thresholds that define classifications for areas designated nonattainment for the 2015 ozone national ambient air quality standards. Furthermore, deadlines have been specified for each nonattainment area to achieve attainment. While this action directly affects state, local, and tribal governments, owners and operators of sources of emissions of volatile organic compounds and nitrogen oxides could be indirectly affected. This is effective on May 8, 2018. More information is available here. The Environmental Protection Agency (EPA) has proposed fees for certain entities subject to the Toxic Substances Control (TSCA) rules for chemical substances. According to the Federal Register, these fees would apply to “any person required to submit information to EPA under the TSCA section 4 or a notice, including an exemption or other information, to be reviewed by the Administrator under TSCA section 5, or who manufactures (including imports) a chemical substance that is the subject of a risk evaluation under TSCA section 6(b)”. “[L]ong standing user fee regulations governing the review of premanufacture notices, exemption applications and notices, and significant new use notices” would also be amended. The end result would be fees that certain manufacturers and processors would have to pay “for each notice, exemption application and data set submitted or chemical substance subject to a risk evaluation”. Standards are also being proposed for determining who qualifies as a small business concern and therefore would be subject to lower fees. The fees proposed cover fiscal year 2019, which begins on October 1, 2018, as well as fiscal years 2020 and 2021. Comments must be received on or before April 27, 2018. More information is available here. The Environmental Protection Agency is seeking comments related to whether wastewater discharge permits should be used to regulate discharges of pollutants from point sources that reach surface waters by travelling through groundwater or another form of subsurface flow. Comments must be received on or before May 21, 2018. More information is available here. The Environmental Protection Agency and the Department of the Army (“the agencies”) have rescinded the current 2015 definition of “waters of the United States,” a term that sets the scope of the water bodies that are protected under Water Pollution Prevention and Control. In the interim, while the agencies aim to redefine “waters of the United States,” the text that was in place prior to 2015 (the 1986/1988 Regulatory Definition) will be used to provide regulatory continuity. A future applicability date of February 6, 2020 has now been specified for the current 2015 definition of “waters of the United States”, meaning that the 1986/1988 Regulatory Definition will be used until February 6, 2020 at a minimum. More information is available here. The Department of Energy has extended the comment period for feedback and thoughts on potential modifications to the process by which they develop appliance standards. The aim, as previously set out, is to reduce burdens faced by corporations as further regulations and standards are developed. The comment deadline has been extended from February 16, 2018 to March 2, 2018. More information is available here. 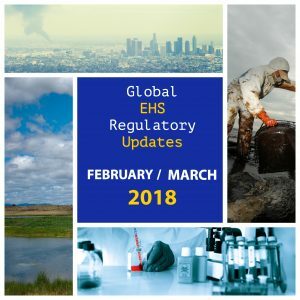 The Environmental Protection Agency has amended the National Emission Standards for Hazardous Air Pollutants for off-site waste recovery operations by removing additional monitoring requirements for pressure relief devices on containers. The conclusion reached is that the inspection and monitoring requirements for containers and their closure devices are sufficient. This is effective on January 29, 2018. More information is available here. Workers from various industries, excluding those from construction, agricultural, and maritime sectors, should be aware that the Michigan Occupational Safety and Health Administration has adopted new conditions related to walking-working surfaces (such as floors, aisles, stairways, runways, ladders, elevated platforms, roofs, and scaffolds) and personal fall protection. The federal standards that Michigan follow have changed. The State adopted these changes by updating, clarifying, renaming, and restructuring its current rules. Conditions regarding cages and wells replacement on all fixed ladders that extend more than 24 feet above a lower level come into force on November 18, 2036. More information is available here, here, here, and here. Residential landowners and other interested parties should be aware of new conditions related to water availability for rural development. The new rules were implemented in response to a 2016 state ruling (the “Hirst decision”) that affected water access and governance throughout Washington State. Notably, the new rules temporarily allow a maximum of 950 or 3,000 gallons per day for domestic water use (depending on the watershed), and temporarily establish a one-time $500 fee for landowners building a home using a permit-exempt well. The new conditions came into force on January 19, 2018. As part of a National Climate Change Action Plan, new emission limits are being proposed for electricity units fuelled by coal, coal derivatives, and petroleum coke, and for new and converted natural gas-fired electricity units. The changes would be put in place by amending the Reduction of Carbon Dioxide Emissions from Coal-fired Generation of Electricity Regulations and by creating a new regulation under the Canadian Environmental Protection Act, 1999, the Regulations Limiting Carbon Dioxide Emissions from Natural Gas-fired Generation of Electricity. The proposed amendments would notably require new and existing coal-fire units to emit no more than 420 tonnes of carbon dioxide per gigawatt hour of electricity by December 31, 2029, unless a carbon capture and storage system is to be constructed. Add new annual reporting obligations for owners or operators of new or converted natural gas-fired units, and allow units to operate above the emission limits during emergency circumstances. Industry stakeholders and interested parties are invited to provide comments by April 18, 2018. More information is available here, here, here, here and here. Amendments have been proposed to the Fisheries Act to modernise protection mechanisms for fish and their habitats. Provide clarity on which types of projects require authorizations through permitting and codes of practice. These amendments have been proposed by means of a bill called “An Act to amend the Fisheries Act and other Acts in consequence”, which at the time of publication of this notice had passed the first reading stage. For more information, please click here, here and here. Amendments regarding the federal impact assessment system are being proposed. Introduce new factors to consider in an impact assessment including interests and concerns of the Indigenous peoples, climate change, gender and identity issues. Expand the definition of ‘navigable waters’ to include waters used, or have a reasonable likelihood of being used, by vessels as a means of transport or travel for commercial purposes, recreational purposes or by Indigenous peoples of Canada. These changes would be put in place by replacing the Canadian Environmental Assessment Act, 2012 for the Impact Assessment Act, by replacing the National Energy Board Act for Canadian Energy Regulator Act and by amending Navigation Protection Act. These amendments have been proposed by means of a bill called “An Act to enact the Impact Assessment Act and the Canadian Energy Regulator Act, to amend the Navigation Protection Act and to make consequential amendments to other Acts”, which at the time of publication of this notice had passed the first reading stage. For more information, please click here, here, here and here. Before significant changes to Alberta’s occupational health and safety legislation come into effect in June 2018, the Alberta government is seeking input into the development of specific rules related to those changes. Functions and training for joint work site health and safety committees. Submissions can be provided until April 9, 2018. More information is available here and here. Following up on changes to spill management rules under the Environmental Management Act that were announced in 2017, the B.C. government is soliciting input from interested parties and the public on a second phase of changes to spill regulations. Comments can be submitted until April 30, 2018. More information is available here and here. Feedback is being sought on proposed changes to worker health and safety rules related to safety headgear, eye and face protection, and concrete formwork and falsework. Comments on the proposed changes will be accepted until May 3, 2018. More information is available here. As part of an initiative to modernize and streamline its regulatory framework, the Manitoba government will be updating its rules for factory built homes and recreational vehicles (RVs). Have a used RV inspected by a provincial regulator before it can be sold. These changes would be put in place by amending The Buildings and Mobile Homes Act and by regulating RVs separately in a new regulation under The Technical Safety Act, which has not yet been proclaimed in force. More information is available here. A carbon pricing mechanism may soon be implemented, requiring industrial facilities emitting more than 50,000 tonnes of greenhouse gases annually to meet the federal performance standards beginning in 2018. These amendments have been proposed by means of a bill called “Climate Change Act”, which at the time of publication of this notice had passed the third reading. For more information, please click here and here. Ontario’s Ministry of Labour is seeking comments on proposed changes to limits, calculations, and listings for exposure of workers to hazardous biological or chemical agents. Adding substitution of hazardous substances with those that are less hazardous as a method that employers must consider to protect workers from exposure. Comments on the changes, which would amend Control of Exposure to Biological or Chemical Agents, Designated Substances, and Mines and Mining Plants, are due on May 4, 2018. More information is available here. Rules requiring employers to protect the health and safety of workers in “industrial establishments”, which include office buildings, factories, arenas, shops, and logging operations, may soon change. Comments on the proposed changes, which would amend the Industrial Establishments regulation, are due April 6, 2018. More information is available here and here. Allow the government to designate water management areas. The public has been invited to comment on the proposed changes to the draft regulations modifying Chapter II, Gas, of the Construction Code and Chapter III Gas of the Safety Code. Enhance the safety of gas installations. Comments must be submitted before April 7, 2018. For more information, please click here, here, and here. As a follow-up to significant changes to the environmental authorization process that came into force at the end of 2017, the public has been invited to comment on additional changes proposed for the next phase of the updates to the authorization process. Set out requirements for the three categories of projects that were established at the end of 2017, the conditions under which a “climate test” is required, and the information needed in a notice of cessation of activities. Regulation respecting the landfilling and incineration of residual materials. Adding the draft Fertilizing Residuals Regulation and Regulation respecting the extension of a stormwater management system eligible for a declaration of compliance. Add provisions related to setting and contesting rates and suspending service by repealing the Regulation respecting waterworks and sewer services and replacing it with the draft Regulation respecting private waterworks and sewer services. Transitional rules are also proposed in the Regulation respecting certain transitional measures to carry out the Act to amend the Environment Quality Act to modernize the environmental authorization scheme and to amend other legislative provisions, in particular to reform the governance of the Green Fund; this regulation and the Regulation respecting private waterworks and sewer services would come into force on March 23, 2018. The other changes described above are expected to come into force on December 1, 2018; comments on these changes must be submitted on or before April 16, 2018. More information is available here, here (in French only), here (in French only), and here. As part of an initiative to modernize Newfoundland and Labrador’s public health rules, current legislation applicable to public health will be reviewed. Notably, the changes aim to add provisions regarding the international spread of disease, chronic disease (such as diabetes), and climate change impact on public health. The changes might affect the Health and Community Services Act and the Sanitation Regulations. Highway vehicle drivers and other interested parties should be aware of new offences and higher fines related to road safety. Add a process for appeals to the Registrar for 90-day impaired driving suspensions. 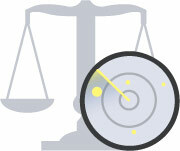 The changes regarding the new appeal procedure for certain licence suspension are in force. The rest of the changes come into force on June 7, 2018. More information is available here and here.